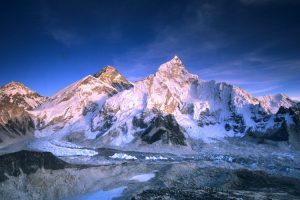 Everest is more than a mountain and theHimalayn journey to its base camp is more than just a trek. Along a route dubbed by some as “the steps to heaven,” every bend in the trail provides another photo opportunity – beautiful forests, Sherpa villages, glacial moraines, and foothills. For active Nepal Guide Info Team not afraid to break a sweat, our full trekking support staff will bring you close to local cultures before opening a window to the top of the world. Day 01: Arrival day in Kathmandu (1,300m/4,264 ft) Overnight at Hotel. • 2 nights accommodation in 2 star category hotel in Kathmandu located tourist center. • Meals on full board (Breakfast, lunch and dinner) during the in trekking. • All accommodations during the trek. • Both ways domestic flight from Kathmandu/ Lukla/ Kathmandu with airport tax. • Group medical supplies (first aid kit will be available). • All necessary Government paper works and national park entry permits and TIMS Card etc. • Travel & Rescue arrangement. • All government taxes and Vat. • Meals yourself Kathmandu (L+D). • Nepal entry visa (You can obtain a visa easily upon your arrival at Nepal’s Airport in Kathmandu). • Personal shopping and laundry etc. • If do any tour and sightseeing and other activities etc. If you acclimate properly, altitude sickness is not an issue. Above 3000m, your sleeping elevation gain should not increase over 300 to 500 m per night. There are many villages and tea house along this trek so you can easily ascend only 300 to 500 m per night. Sleeping elevation is so important because you spend so much time sleeping. Every individual is different and the same person can experience different reactions to altitude on different trips. Above 3000m, first try ascending only 300 m per night. If you handle that well, then you could try pushing it to 500 m per night, but don’t go above that! There is a delay of 7 to 12 hours after arriving at altitude before you start to experience altitude related symptoms. You can arrive at an elevation and feel great, but then you could wake up in the middle of the night with severe altitude related issues. Acclimate properly. You can take Diamox (Acetazolamide) to help with acclimating. Consult a physician to determine if you should take it. People that have certain medical conditions (like liver or kidney disease, allergic to sulfur drugs, etc.). There are other people that shouldn’t take this medication so consult with your doctor. Usually, must Clients take 14 days, Kathmandu to Kathmandu to do this trek. This allows enough time to acclimate properly. Trails could be covered with snow. Generally, January is a cold, dry month, but it could snow. You will be staying in lodges. Bring a sleeping bag rated to – 15 C. If you don’t have this warm of a bag, you can rent one in Kathmandu our company provide a sleeping bag and down jacket . You do not need climbing gear – just trekking gear – layers of hiking clothes – no cotton. Bring warm boots and a change of socks. Don’t forget head gear (hats) and gloves. Also plenty of sunscreen, lip balm and good sunglasses.